Dr. Pavel Rozsival is Director of the Ophthalmology Clinic of the Charles University, Hradec Kralove, Czech Republic.He graduated (MD) in 1974 from the Charles University in Hradec Kralove,Czech Republic.For many years he was President of the Ophthalmology Association of the Czech Republic, a member of the Scientific Council of the Medical Faculty of Charles' University and the Ministry of Health of the Czech Republic.He worked as Head of department at Masaryk Hospital in Ústí nad Labem, Regional Health Corporation from 1986 to 1993. 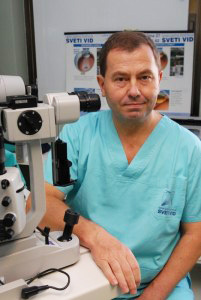 He is a member of leading international ophthalmic associations: ESCRS (European Society of Cataract and Refractive Surgery); AAO (American Academy of Ophthalmology); ISRS (International Society of Refractive Surgery), board member of the International Association for intraocular implants (IIC-Intraocular Implant Club).He has received numerous international awards for his work, among others THE HONOUR OF EXCELENCE and THE GREAT MIND IN OPHTHALMOLOGY. He is the author of several hundreds of professional papers published in prestigious professional journals, with more than 700 professional speeches at domestic and international congresses, now with more than 40,000 surgeries in the eye, cataract operations.